The Private Eye is an important comic. Started almost exactly two years ago, it released to everyone's surprise. 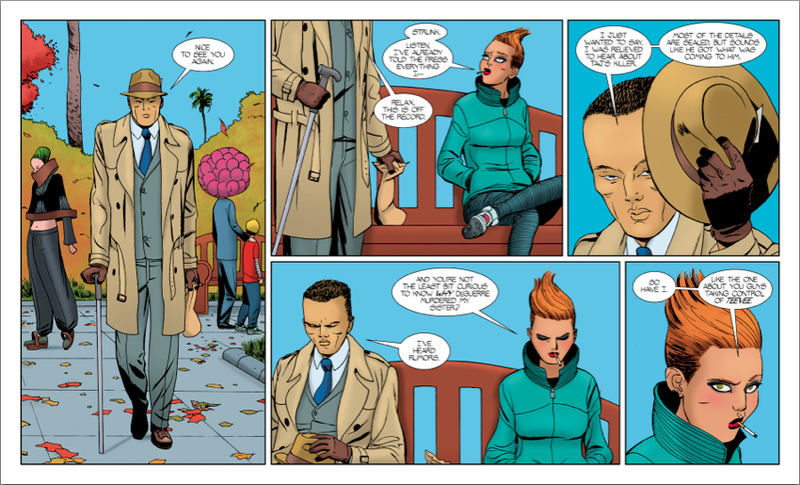 Two of the biggest names in comics, Brian K. Vaughan (Saga, Y the Last Man) and Marcos Martin (Daredevil, Batgirl: Year One) joined up with colorist Muntsa Vicente to bring us a digital-only, DRM-free, pay-what-you-want comic that blew many readers away. I for one rarely read digital comics–I'm a collector as much as a reader, and love thumbing through physical copies–but there was something so different here: this was made to be digital. Everything from the gorgeous widescreen art to the no-limits page count were possible and due to the digital format, and rather than zooming around the page, you could enjoy and read it as it was presented. It was the first digital comics experience that really made an impact on me and quickly became one of my favorite series across all publishers. So, it was with a bittersweet excitement that I double-clicked on the PDF for #10, the last issue of the series, which released Thursday evening. There, welcome back. As you know, the last issue really brought about all the consequences to the dramatic and violent climax in issue #9. Just when P.I. and co. think they have won the day and stopped DeGuerre's plan to bring back the internet, they realize that his rocket is still going to launch, just not into space. #10 opens with huge action as the rocket crashes through the dam that keeps the Pacific Ocean from flooding Los Angeles, leaving P.I. dangling for his life. We are left not knowing if he truly died as he was washed away by the flood, and we see how the media covers up the truth of the catastrophe. We are teased for just a moment that P.I. might be undercover as a journalist, but that idea is quickly tossed aside as we explore the moral consequences of DeGuerre's actions. This issue packs a major punch, both physically and emotionally. The first half dealing with the dam bursting is intense as hell, but the heartbreak surrounding P.I. 's probable demise is where the thing gets really interesting. Vaughan writes a fantastic last scene for one of my favorite characters in the series, the tattoo covered Gramps, who insists that P.I. has "pulled a Reichenbach Falls" but may just be putting on a brave face for P.I. 's young partner who now lives with him. Raveena has a conversation with the journalist Strunk about the truth of what almost happened, and their discussion about the government's possible secret use of DeGuerre's technology hits pretty close to home with our current issues with the NSA. Martin really gets a chance to shine here, and this may be his best work on the whole series. The first half is full of gorgeously terrifying spreads of destruction as the rocket smashes through the dam and explodes in the ocean, sending a tidal wave towards the barely-hanging-on P.I. The closeups and reaction shots during P.I. 's last moments really sell the powerful tension of the scene and provide a strong payoff that is worthy of the death of the main character. While the first half is all action, Martin and Vicente do equally great work on the more character driven second half. It is a bit talking heads, but the facial acting and framing add a cinematic drama to the series' last scene. The last page is absolutely beautiful, and is just abstract enough to allow for a few different interpretations. 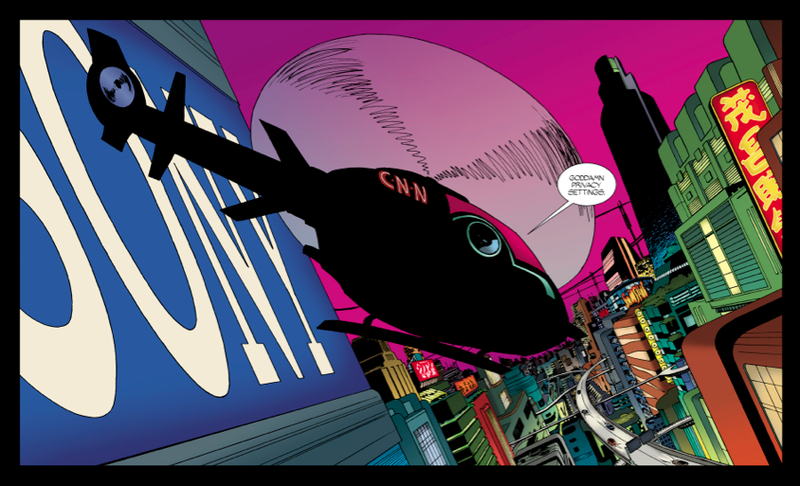 The final issue of The Private Eye is a bit different from other issues in the series; while it is a long issue coming in at 30 pages, it goes by very quickly. This is largely due to the first 19 pages being used for the spectacular denouement of the main story, where the pacing is thrillingly breakneck. The last ten move much more slowly, and you really need the two buffer pages in between as a breather. This issue on its own is not the best of the series; there's not a whole lot of meat to it, whereas some of the others had me reading and re-reading to pick up clues. However, it more than makes up for this with its breathless excitement and emotionally fascinating finale. The series and this final issue explore some very interesting themes: the idea that one day all our private messages, tweets, and profiles will leak out to the public when the "cloud bursts" is a fear that many of us might have, and the future that Vaughan, Martin, and Vicente built upon this idea is fascinating. It is a world where the digital has become extinct; physical books and vinyl records have made major returns, and nearly everyone wears a mask in an attempt to control real-life privacy settings. What is really compelling about this last issue is the transition from digital back to physical as it is writ large here, with the cloud burst now happening tangibly in the form of the dam bursting. The question the last few pages leaves us with, however, is whether this flood was the final nail in the coffin for digital data and online personas, or the beginning of its return as hidden government surveillance. It's a good last issue, but the series overall is almost certainly a masterpiece. 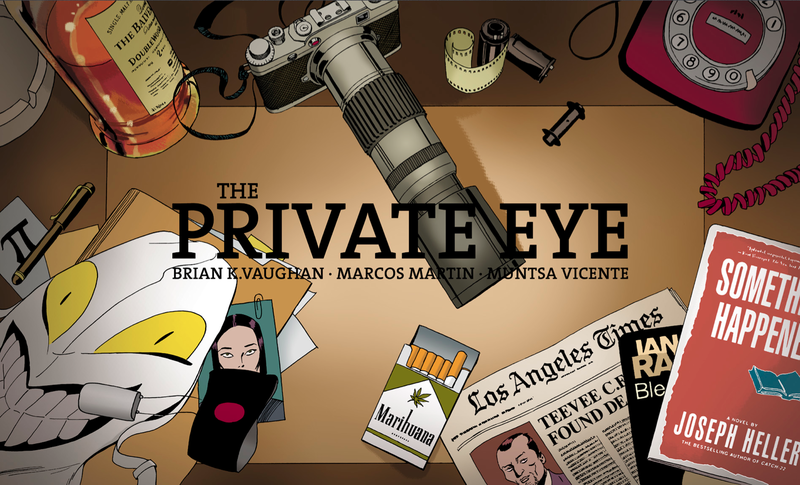 I believe The Private Eye will not just be a footnote in comics history as a landmark move for digital, pay-what-you-want, and self-published comics–although that footnote ought to be pretty substantial–I believe this series will go down as one of the best comic stories told in recent years. It has captivated me for two years; no comic has elicited the same excitement as the moment I saw the email informing me that a new issue was available for download. I cannot recommend it highly enough! The world that Vaughan, Martin, and Vicente have encapsulated in these ten issues is seductively gorgeous, heartbreakingly poignant, and most importantly, told with the storytelling skills of masters exploring a new realm of possibility. 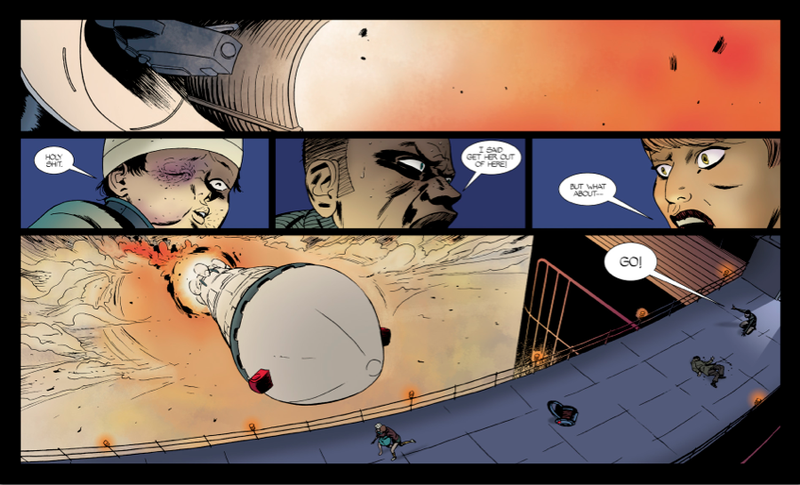 All ten issues, as well as a behind the scenes issue, can be downloaded at panelsyndicate.com for whatever price you desire.